Don't you love Chinoiserie wallpaper but hate it's high price? Well, we have a solution: some amazing Chinoiserie stencils! Get the look of sophisticated, refined chinoiserie or toile for the fraction of the cost of wallpaper! With these beautifully designed wall stencils, you can create that Pinterest-worthy upscale chinoiserie dining room that you've dreamed about. 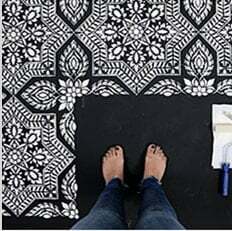 These beautiful patterns are created by stencil designer Janna Makaeva. Chinoiserie never really goes out of style, so you'll be enjoying your stenciled dining room for years to come. Toile and chinoiserie patterns also work well in bedrooms, hallways and baths. Learn How To Stencil from our expert video tutorials!